Out of the Sand, the golf and sports simulator provider in Midway Shopping Center, will soon close its doors. Scott and Tanya Sykes leased space at the shopping center last October and installed three playing spaces with high-tech equipment for golfers looking to tune up their game in all-weather conditions. Unfortunately, not enough golfers living in or visiting the Cape Region used the simulators to make the business a success. A severe drop in signups for fall golf leagues convinced the Sykes to stop. “The reception we received in the last ten months has not been enough to justify putting out the money it would take to stay in business,” Scott Sykes said. The Sykes expressed appreciation for the customers they served, and will spend the next two weeks selling equipment and closing it down. The par-4 second hole on the Bay course at Seaview deserves its reputation as one of the hardest holes LPGA players face during the ShopRite LPGA Classic presented by Acer. The 2d green at the Bay Course, scene of the ShopRite LPGA Classic, juts into the marsh for a dangerous approach shot for the long par-4. 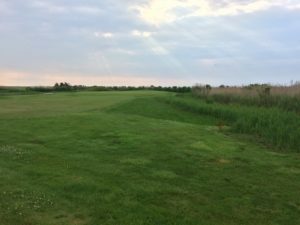 Usually set at 421 yards, the green juts into the marsh west of Reeds Bay. Red stakes mark the greenside edges on the left, right, and back. The green also features some serious mounding, as expected from a Hugh Wilson/Donald Ross design. The path to the hole is no picnic, either. High fescue mounds catch and keep shots straying right or left. To add to the fun, gnats and mosquitoes are pretty distracting if there’s no wind. During the opening round of the 2018 ShopRite, I followed Jackie Concolino, Jennifer Song, and Ayako Uehara as they played the hole. Each made bogey in different ways, proving that the second’s reputation is deserved. Concolino came to the Tour in 2012 and enjoyed her most successful season yet in 2017. Uehara won three times on the Japan LPGA and began her rookie career on the LPGA Tour in 2013. She tied for 8th in the ANA Inspiration this spring. Song joined the Tour in 2011 and finished in 48th place for the 2017 season. She finished 8th at the 2017 Evian Championship. Concolino made birdie on the first hole with a putt from the fringe 10 feet from the hole. With honors on the second tee, she tugged her drive left into thick rough 192 yards from the center of the green. Uehara hit a pretty drive straight down the middle, 173 yards out. Song was lucky with her drive in one sense. It landed in the right rough 180 yards away, about a foot past a mound of high fescue. However, her next shot needed to stay low to keep under tree branches 10 to 15 yards ahead of her. It didn’t happen. Song’s second shot clattered into the branches and bounced into rough 100 yards out. Her third shot landed 25 feet right of the hole, on the left rear of the green. Concolino’s shot from the left rough took off nicely but came up well short in the fairway, about 40 yards from the front of the green. Uehara used a fairway wood for her second shot but missed the green, stopping about 2 feet away in the closely mown front fringe. Song’s first putt finished a foot away and she made bogey from there. Concolino snuggled her putt from the fringe to tap-in range for her bogey. Uehara had the best chance for par, but her first putt from the fringe ran up and over a mound and stopped 7 feet past the hole. She missed the par putt and took her bogey. Uehara told me later the second hole was one of two three-putt bogeys in her even-par round.Her caddy and I convinced her to only count two putts on the second hole, because her first attempt was from off the green. This discussion made Uehara grin broadly. After covering this tournament for several years, I know I have seen more bogeys than pars on this hole. On the other hand, the short par-5 third hole often sees more birdies than pars. Perhaps Wilson and Ross knew they should do something to ease the pain of an early-round miscue. The Kings Creek CC Ladies 18 Hole group played a 1 of 4 better ball gameSept. 20. Leslie McClintick, Trish Ritthaler, Marilyn Hewitt, and Kelly Brown (blind draw) won first place. Sherry Pie, Jeannine Doane, Melanie Pereira, and Arlyce Dubbin took second. Jean Chlastawa, Nancy Martino, Debbie Grant, and Susan Griesemercame in third. Katie Heintz, Nancy Froome, Anne Farley, and Nathalie McGregor finished fourth. The Rehoboth Beach CC 18-hole ladies used two scores of four for their Sept. 19 game. JoJo Barrows, Ann Cunningham, Suzanne Moore, and Kim Stocksonwon first place net, while Joan Crowley, Daisey Hudson, Carole Medd, and Gayle Truittwon first place gross. Moore was closest to the pin on the third hole. Pris DeSena, Sheila Halfpenny, Reagan Roberts, and Cyndy Simeone took second net. Kim Stockson was closest to the pin on the 19thhole. The Kings Creek CC Ladies 9-Hole group played a best ball of three game Sept. 19. Rosemarie Schmidt, Rita Musi and Janie O’Connorwon first place, with Carolyn Horn, Sandy Neverett and Carole Ellisontaking second. Patti Davis was closest to the pin on the 17thhole.